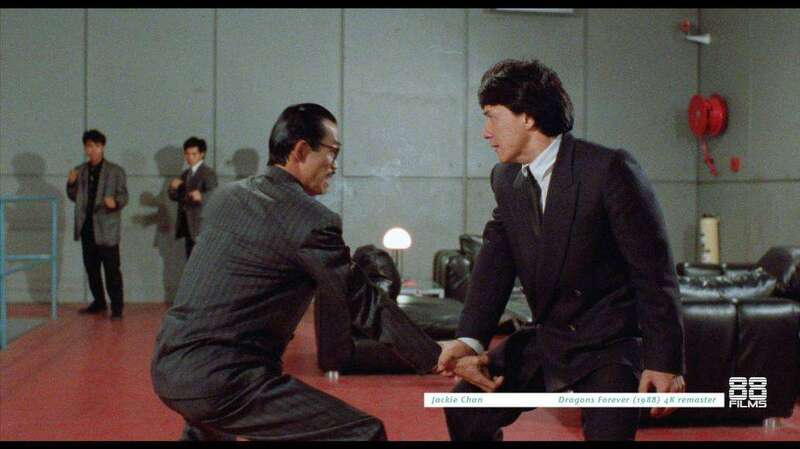 Following their releases of films like “Snake and Crane Arts of Shaolin”, “Battle Creek Brawl” and “To Kill With Intrigue” UK distributor 88 Films has announced the release of four more titles featuring iconic actor and martial arts star Jackie Chan. According to Blu-ray.com “Dragons Forever”, “Miracle a.k.a. The Canton Godfather”, “Crime Story” and “The Protector” will be released in the near future. Synopsis: Hotshot lawyer is hired by a mysterious chemistry factory to dig up dirt on an inconvenient fishery seeking damaging court action. Sidekick Hung and professional crook. Yuen swiftly sprint to Chan’s aid. Ironically the gang finds their toughness softening in the face of two gorgeous ladies at the fishery. They inadvertently hit a center nerve of the chemical factory when they unmask the hideous fade of a narcotic syndicate. BRAND NEW 4K REMASTER OF THE FILM. Synopsis: A country boy becomes the head of a gang through the purchase of some lucky roses from an old lady. He and a singer at the gang’s nightclub try to do a good deed for the old lady when her daughter comes to visit. Synopsis: In the tradition of Rumble In The Bronx, Supercop, and Rush Hour, action champ Jackie Chan stars in this hard-hitting story ripped from today’s headlines! Chan plays a special agent assigned to protect a wealthy business magnate. But when the businessman is kidnapped in a daring ambush, Chan teams up with a seasoned detective to crack the case…even though he suspects the detective is the crime’s true mastermind! Based on an amazing real-life story – Chan’s never been tougher, as he goes all out in his attempt to rescue the hostage…and finally expose the crooked cop! NEW 2K REMASTER OF THE FILM. Synopsis: The tactics of tenacious New York cop Billy Wong (Jackie Chan) are one thing, police procedure is another. He and his partner Garoni (Danny Aiello) have been busted to crowd control. The demotion comes just in time. It puts Billy and Garoni in the know – and in the flow – of the world’s largest heroine pipeline… and sends them winging off to Hong Kong to shut it down. In his first starring American movie, the rambunctious Chan brings seething energy, jovial humor and the daredevil knack for clever action – set pieces that came to further crowd-pleasing perfection on future hits like Rumble In The Bronx and Rush Hour. In his hands, you’re well protected – and well entertained.